A very warm New Year’s greeting to you! It may still be wet and gloomy outside, but I feel that the cheer of spring is coming just around the corner. This issue will continue to introduce more exhibitions organised in Paris as part of Japonisme 2018. It includes exhibitions on paintings from the innovative Rinpa school, Buddhist sculptures from the ancient city, Nara, as well as on the Francophile artist Tsuguharu Foujita. I’ve also included a recap on the Meiji art exhibition at the Guimet. I can only introduce a few exhibitions in the limited space here, but for more information on the series of events in 2019 hosted and related to the Japonisme 2018, please check their website. I hope you have a chance to visit Paris this winter. The Rinpa style was created by Hon’ami Kōetsu (1558-1637) and Tawaraya Sōtatsu (d. ca. 1640) in the first half of the 17th century. The term ‘Rinpa’, literally meaning ‘School of Kōrin’, traces its lineage to the acclaimed painter, Ogata Kōrin (1658-1716). Yet, Rinpa was not a traditional painting school where hereditary family of painters succeeded the ranks. It was rather a group of individual artists who shared a common interest to pursuit a certain set of aesthetic styles and painting techniques. Self-proclaimed Rinpa artists were numerous and spanned over several generations. This exhibition features Rinpa masterpieces from Kyoto including a pair of two-panelled folding screens of Wind God and Thunder God [Fūjin Raijin] (National Treasure) from Ken’ninji temple in Kyoto, and a pair of six-panelled folding screens of Narrow Ivy Road [Tsuta no hosomichi] (Important Cultural Property). Wind God and Thunder God, painted by Tarawaya Sōtatsu, is arguably the most well-known Rinpa painting that employs Rinpa’s distinctive style of tarashikomi, where a brush laden with lavish pigment is used to drop and distribute the colour onto a wet saturated ground for a blended marbling effect. The lesser known folding screens, Narrow Ivy Road, show a very unique aspect in terms of their compositional arrangements. Conventionally, a pair of folding screens would have a predetermined left-right orientation for viewing according to the image and the placement of signature and seal. Interestingly for Narrow Ivy Road, the motif continues to work even if the screens are placed the ‘wrong’ way round. The green path as well as the golden path perfectly meet at both ends. The screens depict a scene from the Tales of Ise, a novel frequently referenced by Rinpa artists that was written in the Heian period (794-1185). Here, the seven waka poems read by court poet Karasuma Mitsuhiro (1579-1638) are inscribed on the screen. The exhibition is not all about paintings. More than 60 works of art, which covers calligraphy, ceramics and lacquerware, are on display in a chronological order, divided into four different generations of artists in the Rinpa. Just finished but very much worth reflecting on is the Meiji: Splendors of Imperial Japan exhibition. 2018 marks the centennial of the death of Emile Guimet, the founder of the museum. The year also coincides with the 150th anniversary of the beginning of the Meiji period (1868-1912). Meiji period saw Japan rapidly modernise. The country became a constitutional nation-state and developed a modern industrial infrastructure. Simultaneously, it also sought to preserve and nurtured its artistic traditions and internationalised them. Since 1873, various artworks such as ceramics, metalworks, enamels, lacquerware and other decorative arts, were presented at both domestic and international expositions. The Meiji exhibition at Guimet represented the richness of the European collections of Japanese art from the Guimet, Victoria and Albert Museum and British Museum. Furthermore, the show included exceptional loans from the Khalili collection, which comprehensively covers the different artistic examples from the Meiji period. They are exquisite works of art that epitomise the outstanding craftsmanship at that time. Concurrently, an exhibition titled ‘Japon – Japonismes. Objets inspirés, 1868-2018’ is being held at the Musée des Arts Décoratifs until March 3. These two exhibitions complement and enrich each other. While the Guimet exhibition itself has closed, the Khalili collection is digitised and available for view online. Nara is an ancient city in Japan and was once the capital from 710 to 784. Since the mid-8th century, Nara’s Shōsōin Repository has carefully safeguarded the treasures that came to Japan through the Silk Road trade, of which some they exhibit annually to this day. This exhibition features Buddhist treasures from Kōfukuji temple in Nara. The Kōfukuji temple has a long history of its own. Originally named Yamashinadera temple in 669, the temple was moved to Asuka and renamed as the Umasakadera temple in the late 7th century. When the capital was relocated to Heijōkyō (present day Nara) in 710, the temple also moved to Nara and renamed to the current name of Kōfukuji temple. Kōfukuji temple was once destroyed by fire in 1180 during the civil war, however, fortunately it was restored shortly thereafter. This exhibition brings Kōfukuji temple’s treasures to the Parisian audience. Exhibits include a pair of standing wooden statues of Kongō Rikishi (Vajra Warriors), which is designated as a National Treasure, as well as a standing wooden statue of Jizō Bosatsu (Ksitigarbha Bodhisattva), which is designated as an Important Cultural Property. The Kongō Rikishi statues were created and dedicated to the temple in the Kamakura period (1185-1333). The pair consists of A-gyō statue and Un-gyō statue, which symbolically represents the beginning and the end of all things in Sanskrit. The life-size statues with realistic muscular bodies represent typical characteristics of wooden statues from the Kamakura period. In contrast, the Jizō Bosatsu, which is smaller than the Kongō Rikishi but nonetheless stands nearly 140 cm tall, was sculpted from a single tree. It has a round body with a soft facial expression and is said to be made around the 10th century. The exhibition will offer a very rare opportunity to experience the culture of figurative art of Buddhism in Paris. 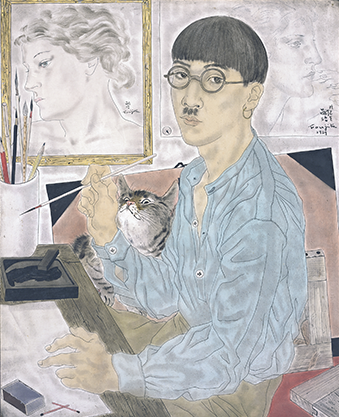 Fujita Tsuguharu (1886-1968), or more widely known as Tsuguharu Foujita outside of Japan, was a prolific artist who loved and made his name in Paris. He spent nearly half of his life there and acquired French nationality in 1955. He continued to live and work in the capital city until his death in 1968. Foujita found his success and acclaim in the 1920s. His distinctive painting technique that combined Western influences and traditional Japanese brushwork were highly praised by the critics when he showed his unique ‘milk white’ female nudes at the Salon. The sumptuous colour used to portray the angelic skin of women were seen with great admiration and were prized by collectors who were willing to spend a considerable fortune on his work. This is the second exhibition to commemorate the 50th anniversary of Foujita’s death in 1968. Little earlier this year, the Musée Malloli organised a separate Foujita’s exhibition, titled ‘Foujita: Painting in the Roaring Twenties’ and held between March and July. Musée Malloli’s exhibition concentrated on Foujita’s first stay in Paris between 1913 and 1931 (the exhibition catalogue is also available). Maison de la culture du Japon à Paris’s Foujita exhibition will focus on three key stages of his life: First, on his initial life in Paris between 1913 and 1931 when he gained his artistic reputation; second, on his travel period between 1930s and 1940s when he moved back to Japan and travelled more widely to countries in Central and South America; and third, on his final life in Paris from 1950 to his death. His art created during his first stay in Paris are widely recognised, yet his works produced between 1930s and 1940s especially are rarely seen and little known outside of Japan. This exhibition will provide a broader perspective on Foujita’s work and career. The exhibition is a touring one and has been held in Japan in 2018 at the Tokyo Metropolitan Art Museum and at the National Museum of Modern Art, Kyoto. The exhibition will finish in Paris in 2019. A dedicated website to the exhibition and the exhibition catalogue (though written in Japanese) are also available. All the exhibition details and publication information introduced here and more can be found on the comprehensive research database, developed by the Tokyo National Research Institute for Cultural Properties, known as Tobunken. As a research partner of Tobunken, the Sainsbury Institute contributes by gathering data and information on Japanese art exhibitions taking place outside of Japan and publications in English.